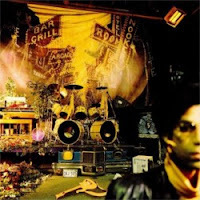 30 on the 30th: Sign o' the Times and "Strange Relationship"
Following up on last month, April's entry into the class of 1987: Prince's stupendous Sign o' the Times. Did I buy this album as soon as it hit the stores? No way; it was a double-album, and I was much too cheap to spend that kind of money on a Prince album. But I had friends who did buy it, and I listened to it whenever I could, to try to dig into the rich catalog it displayed beyond the radio hits ("U Got the Look" most especially). Growing up as I did in a conservative but not particularly controlled family environment, it was easy to be scandalized by Prince, and there were various comparisons that I, like many others, made in my head between him and Michael Jackson. This Slate article captures some of that (and yes, I do remember watching that Billy Crystal skit on SNL), but for me in particular there was a kind of Buddy Holly vs. Elvis Presley quality to it: Prince was terrifically talented, sure, but he also was dangerous, probably corrupt, at the very least a provocateur for the sake of provocation. Better to stick with the safe, good kid from the Jackson 5 (or so it was easy for a white 18-year-old kid to believe at the time). But the tracks on Sign o' the Times challenged all that, or at least started to. Yes, my musical tastes at the time were pretty limited, but still: I was aware of Parliament Funkadelic, I'd heard of James Brown, I watched Soul Train on occasion. Listening to "Sign o' the Times," "Starfish and Coffee," or "I Could Never Take the Place of Your Man," I realized: this man was coming up with original, cool takes on all sorts of soul and R&B, not to mention rock and roll. It would take me years to fully articulate this opinion, but I think it was with this album, way back during my senior year, that I realized that Prince wasn't just some brilliant, oversexed weirdo, but rather was actually one of the most talented pop songwriters and performers of the second half of the 20th century, up there with Bowie and Dylan. Michael Jackson? A great and culturally important entertainer and singer, for certain, but that's all. Prince, on the other hand, really was The Artist, and Sign o' the Times was the proof. What track to play? "Strange Relationship," a funky, upbeat love song with just a touch of Prince's ever-present naughtiness. This is a live performance from Las Vegas, and I love the horns.